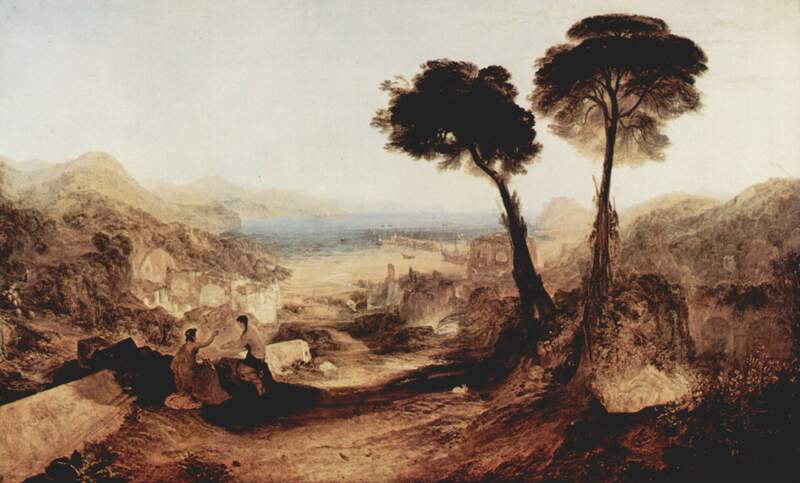 Baia and the Bay of Naples, painted by J.M.W. Turner in 1823, well before modernisation of the area obliterated most traces of its Roman past. Image: Wikicommons. Now revised and updated to September 2016. There is nothing remotely Elysian about the Phlegræan Fields; nothing sylvan, nothing green. The Fields, which lie on the north shore of the Bay of Naples, are part of the caldera of a volcano that is the twin of Mount Vesuvius, the destroyer of Pompeii, a few miles to the east. The volcano is still active, but, today, its most obvious feature is this barren, rubble-strewn plateau. Fire bursts from the rocks in places, and clouds of sulphurous gas snake out of vents that lead up from deep underground. The Fields, in short, are hellish, and it is no surprise that they have always been associated with all manner of strange tales. Most interesting, perhaps, is the myth of the Cumæan sibyl, who took her name from the nearby town of Kyme – Cumæ – a Greek colony that flourished in about 550 B.C., when the Etruscans still held sway much of central Italy and Rome was nothing but a city-state ruled over by a line of tyrannical kings. Sulphur drifts from a vent on the barren volcanic plateau known as the Phlegraean Fields, a harsh moonscape associated with legends of prophecy. The sibyl, so the story goes, was a woman named Amalthæa who lurked in a cave on the Phlegræan Fields. She had once been young and beautiful –beautiful enough to attract the attentions of the sun god, Apollo, who offered her one wish in exchange for her virginity. Pointing to a heap of dust, Amalthæa asked for a year of life for each particle in the pile, but (as is usually the way in such old tales) she failed to allow for the vindictiveness of the gods. Ovid, in Metamorphoses, has her lament that “like a fool, I did not ask that all those years should come with ageless youth as well.” Instead, she aged but could not die. Virgil depicted her scribbling predictions of the future on oak leaves that lay scattered about the entrance to her cave, and states that the cave itself concealed an entrance to the underworld. The best known – and from our perspective the most interesting – of all the tales associated with the sibyl is supposed to date to the reign of Tarquinius Superbus – Tarquin the Proud. He was the last of the mythic kings of Rome, and some historians, at least, concede that he really did live and rule in the 6th century B.C. According to legend, the sibyl travelled to Tarquin’s palace bearing nine books of prophecy that set out the future of Rome. She offered the set to the king for a price so enormous that he summarily declined – at which the prophetess went away, burned the first three of the books, and returned, offering the remaining six to Tarquin at the same price. Once again, the king refused, though less arrogantly this time, and the sibyl burned three more of the precious volumes. The third time she approached the king, he thought it wise to accede to her demands. Rome purchased the three remaining books of prophecy at the original steep price. 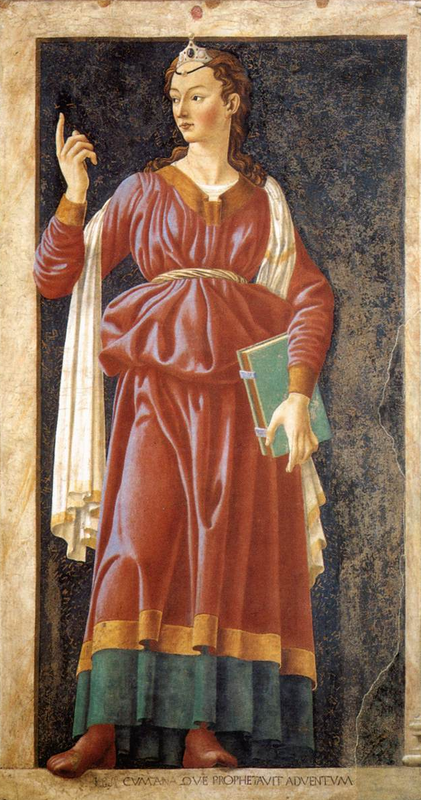 A Renaissance-era depiction of a young Cumæan sibyl by Andrea del Catagno. The painting can be seen in the Uffizi Gallery. What makes this story of interest to historians as well as folklorists is that there is good evidence that three Greek scrolls, known collectively as the Sibylline Books, really were kept, closely guarded, for hundreds of years after the time of Tarquin the Proud. Secreted in a stone chest in a vault beneath the Temple of Jupiter, the scrolls were brought out at times of crisis and used, not as a detailed guide to the future of Rome, but as a manual that set out the rituals required to avert looming disasters. They served the Republic well until the temple burned down in 83 B.C., and so vital were they thought to be that huge efforts were made to reassemble the lost prophecies by sending envoys to all the great towns of the known world to look for fragments that might have come from the same source. These reassembled prophecies were pressed back into service and not finally destroyed until 405, when they are thought to have been burned by a powerful general by the name of Flavius Stilicho. The existence of the Sibylline Books certainly suggests that Rome took the legend of the Cumæan sibyl seriously, and indeed the geographer Strabo, writing at about the time of Christ, clearly states that there actually was “an Oracle of the Dead” somewhere in the Phlegræan Fields – a statement that implies, in turn, that the Romans believed an entrance to the underworld existed somewhere on the plateau. So it is scarcely surprising that archaeologists and scholars of romantic bent have from time to time gone in search of a cave or tunnel that might be identified as the real home of a real sibyl – nor that some have hoped that they would discover an entrance, if not to Hades, then at least to some spectacular subterranean caverns. 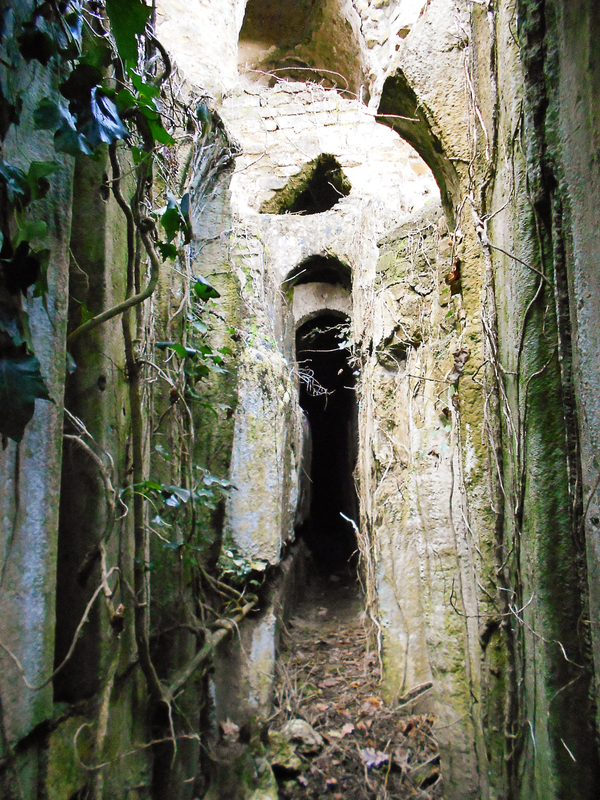 Several spots have been identified as the antro della sibilla – the cave of the sibyl – over the years. None, though, led to anywhere that might reasonably be thought to be an entrance to the underworld. Because of this, the quest continued, and gradually the remaining searchers focused their attentions on the old Roman resort of Baia, which lies on the Bay of Naples at a spot where the Phlegræan Fields vanish beneath the Tyrrhenian Sea. Two thousand years ago, Baia was a flourishing spa, noted both for its mineral cures and for the scandalous immorality that flourished there. Today, it is little more than a collection of picturesque ruins – but it was there, in the 1950s, that the Italian archaeologist Amedeo Maiuri discovered the entrance to a hitherto unknown antrum. It had been concealed for centuries beneath dense undergrowth sprouting from a vineyard; Maiuri’s workers had to clear a 15-foot-thick accumulation of earth and vines to lay it bare. The antrum at Baia proved difficult to explore. A sliver of tunnel, obviously ancient and manmade, disappeared into a hillside close to the ruins of what may be a Greek temple. The first curious onlookers who pressed their heads into its cramped entrance discovered a pitch-black passageway that was uncomfortably hot and – so Maiuri reported – wreathed in fumes; they penetrated only a few feet into the interior before beating a hasty retreat. There the mystery rested, and it was not revived until the site came to the attention of Ferrand Paget – who liked everyone to call him “Doc” – in the early 1960s. 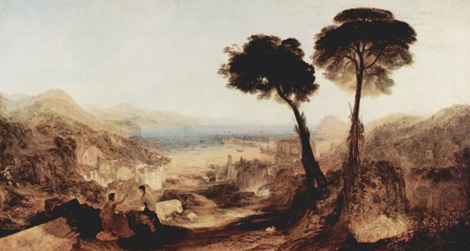 Paget was one of the handful of men who still hoped to locate the “cave of the sibyl” described by Virgil, and it was this obsession that made him willing to risk the inhospitable interior. He and Jones pressed their way though the narrow opening and found themselves inside a cramped tunnel, about six feet [1.8m] tall but a mere 21 inches [53cm] wide. The temperature inside was uncomfortable but bearable, and the two men pressed on into a passage that, they claimed, had probably not been entered for 2,000 years. An overview of the tunnel system at Baia – 3D modelling by John Smout of the Oracle of the Dead site. Reproduced with permission and thanks. It took Paget and Jones, working in difficult conditions, some time to explore what turned out to be a highly ambitious tunnel system. The interior included an oddly complex network of narrow passageways, the entrances to some of which proved to be blocked up or disguised, and whose precise purchase Paget could only guess at. It is fair to say that most of those who have come after him have admitted themselves more or less baffled by at least some of the odder aspects of the tunnels. The first of these peculiar features occurred about 400 feet [125m] from the entrance, at a spot where the path diverged, only to merge again some 330 feet [100m] further into the complex. Paget suggested that this “dividing of the ways” had at one time been masked by a wooden door. Swung closed, this would have masked one route to the lower levels. But, opened, it could have been used (so the explorer suggested) as a ventilation system; hot, vitiated air would be sucked out of the tunnel complex at ceiling level, while currents of cooler air from the surface were constantly drawn in along the floor. “Doc” Paget’s plan of Baia’s mysterious “Oracle of the Dead” shows the complex layout of the tunnels and their depth below ground level – though more recent reconstructions reveal some errors. Click to view in higher resolution. As Paget and Jones went deeper into the hillside, two further puzzles revealed themselves. First, at the bottom of a much steeper passage, some 650 feet [200m] inside the tunnel, they discovered an underground stream 6 feet [1.8m] wide, which disappeared into the darkness. The river itself was hot to the touch. Fording it and ascending a steep passageway on the far bank, the men next came upon what they thought had been an “inner sanctuary.” What this room was, or had been used for, remains a mystery; at some point in the tunnels’ history, it had been laboriously filled in, and it has never been excavated. 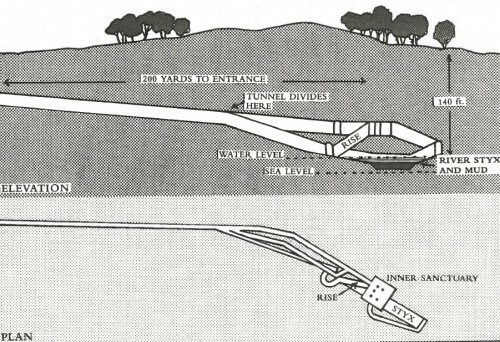 Further blockages were found elsewhere in the tunnel system; according to Paget’s rough calculations, something like 7,000 cubic feet [200m3] of soil had been carried in baskets from the surface, an operation that would have required 15,000 man-journeys down the narrow passageways. Somebody, he decided, had once been very anxious to stop up the tunnel system and conceal its purpose. So what was the “Great Antrum,” as Paget called it? Who had built it – and what had it been used for? And who had blocked access to it? In time, “Doc” came up answers to all of those questions. 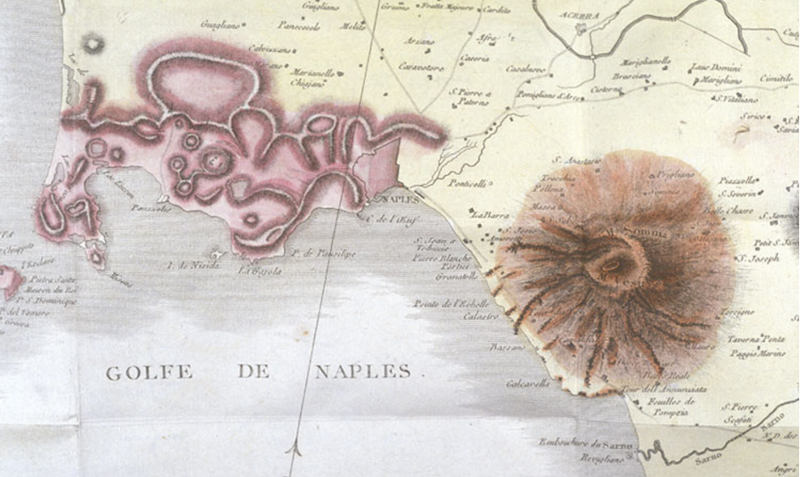 The Phlegræan Fields (left) and Mount Vesuvius, after Scipione Breislak’s map of 1801. Baiae lies at the northeastern tip of the peninsula of Bacoli, at the extreme westerly end of the Fields. 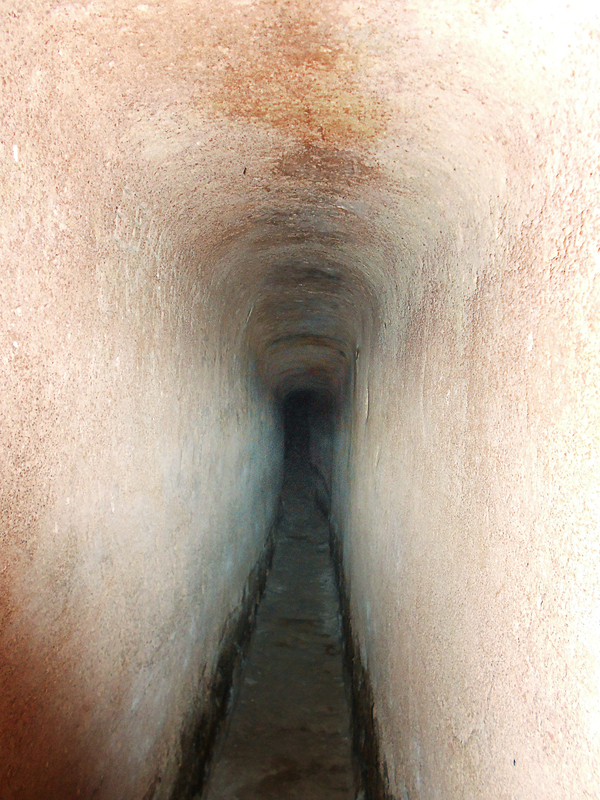 The tunnels, then, in Paget’s view, might have been constructed to allow priests to persuade their patrons – or perhaps simply wealthy travellers – that they had journeyed to the underworld. The heightened temperatures below ground, combined, perhaps, with drifts of volcanic vapour, could certainly have given that impression. And if visitors were scared, befuddled, or even drugged, it would have been possible to create a powerfully otherworldly experience, one capable of persuading even the most sceptical of the priests’ power. The Great Antrum is now lined with Roman-era cocciopesto waterproof cement. Image: oracleofthedead.com. In favour of this argument, “Doc” supposed, was the careful planning of the tunnels. He pointed to the huge number of lamp niches which had been built into the tunnel walls; there are more than 550 in all, and they come at the rate of one every three feet [0.9m] in the lower levels, far more than would have been required merely to provide illumination. This feature made no sense if the tunnels were (as more mainstream archaeologists have always suggested) merely devised to channel warm air to Baia’s famous Roman baths above. And the “dividing of the ways,” with its hidden door, would have allowed a party of priests – and the “sibyl,” too, perhaps – quick access to the hidden sanctuary. Indeed, the whole system, Paget thought, closely matched ancient myths of visits to the underworld. In Virgil’s Aeniad, for instance, the hero, Aeneas, crosses the Styx only once on his journey underground, emerging from Hades by an alternate route. The discovery of a further, blocked, tunnel at the back of the hill suggests that the complex at Baia may have been constructed to allow just such a journey. And since Virgil himself, in Paget’s argument, had lived nearby, he might himself have been initiated into Baia’s mysteries. Dating the construction of the complex was a greater challenge. The explorers found little evidence inside the tunnels to point to the identity of the builders – just a mason’s plumb bob in one niche, and some ancient graffiti, which can be read as a date: “IIII KAL MAR,” or 26 February, in an unknown year. But, working on the assumption that the passages had once formed part of the surrounding temple complex, they concluded that they could best be dated to the late archaic period, around 550 B.C. – at pretty much the time, that is, that the Cumæan sibyl was said to have lived. If so (and Italian archaeologists prefer to believe that the tunnels are later, and Roman) then the complex was almost certainly the work of the Greek colonists of Cumæ itself. As for when the tunnels were blocked up, that – wrote Paget – must have taken place after Virgil’s time, during the early Imperial period of Roman history. But who exactly ordered the work, or why, he could not say. In time, Paget and Jones resolved at least one of the Great Antrum’s mysteries. In 1965 they persuaded a friend, Colonel David Lewis of the U.S. Army, to investigate the Styx for them using scuba apparatus. Lewis and his son dived into the stream and followed it into a tunnel that dramatically deepened, discovering an underwater cave, along with the source of the stream’s warmth: two springs of boiling water, superheated by the volcanic chambers of the Phlegræan Fields. The Styx, Lewis reported, is fed by two narrow entrances to the left of it, now submerged. These entrances are hand cut, and a man can just squeeze through. Lewis also found a tunnel leading up to Paget’s “sanctuary” from the back end of the Styx. It remains blocked with soil and has not been properly explored by anyone. One of the two boiling springs that feed the “Styx,” photographed in 1965, 250 feet beneath the surface, by Colonel David Lewis, U.S. Army. Whether Paget’s elaborate theories are correct remains a matter of debate. It seems much more likely than not that the tunnel complex served some ritual purpose; in addition to the mute evidence of the lamp niches, the recent efforts of another British researcher, John Smout, have established that the entrance passageway was angled so that it would have been picked out and illuminated by the sunrise over Mount Vesuvius at each equinox around 500 B.C. One central question may well be whether it is possible to see Paget’s channel of “boiling water” deep underground as anything other than a deliberate representation of one of the fabled rivers that girdled Hades – if not the Styx itself, then perhaps the Phlegethon, the mythic “river of fire” that, in Dante’s Inferno, boils the souls of the departed. And for all the scepticism of the archaeologists, historians of the ancient world do not dispute that the powerful priests of antiquity were perfectly capable of mounting elaborate deceptions. A recent geological report on the far better known Greek oracle site at Delphi demonstrated that fissures in the rocks nearby brought intoxicating and anaesthetic gases to the surface at the spot, suggesting that it may have been selected and used for a purpose much like the one Paget proposed at Baia. 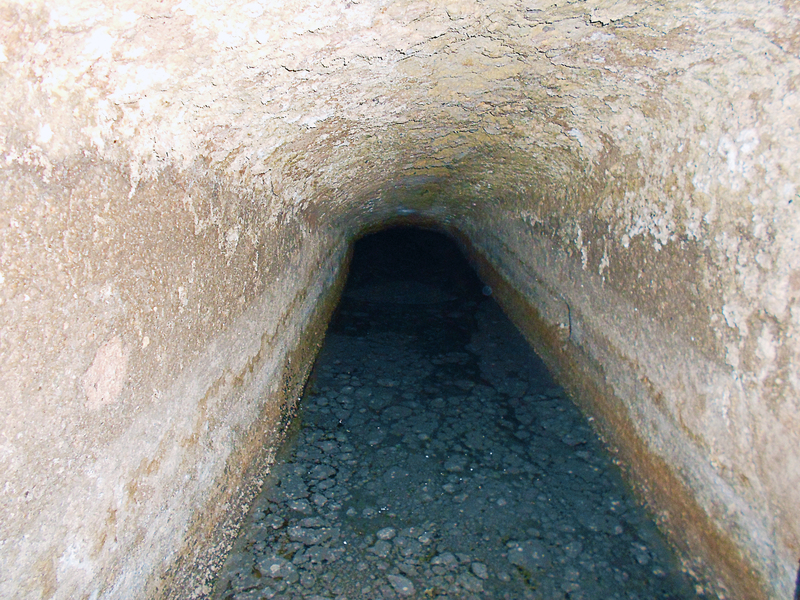 Yet much remains mysterious about the Great Antrum – its purpose, its still hidden exits, and, not least, the vexed question of how its ancient builders, working with primitive tools at the end of the Bronze Age, could even have known of the existence of the “River Styx,” much less excavated a tunnel that so neatly intercepted it. There is no trace of the river at the surface – and we still have no real idea where its source is, or where it leads. A side view of the Oracle tunnel complex. 3D mapping by oracleofthedead.com. Little seems to have changed at Baia since Paget’s day. His discoveries have made remarkably little impact on tourism at the ancient resort, and his willingness to embroider evidence (and, at least occasionally, to just make it up) means that work still needs to be done to unpick fact from fiction in the Great Antrum. Today the network of passages is locked up, infested with scorpions, and dangerous to enter. Little attempt is made to exploit the idea that the narrow entrance in the rock was once thought to be an entrance to the Roman’s hell – and, pending proper investigation by archaeologists, not much more can be said about the tunnels’ origin and purpose. But among the many mysteries of the ancient world, the Antrum on the Bay of Naples remains among the most intriguing. My thanks to John Smout and Peter Knight for several illuminating discussions regarding the Oracle site and Doc Paget’s claims. For full details of the tunnel complex, and to keep up to date with ongoing research at Baia, visit oracleofthedead.com. Tunnels inexplicably divide within the Great Antrum. Image: oracleofthedead.com. C.F. Hardie. “The Great Antrum at Baiæ.” Papers of the British School at Rome 37 (1969); Victor Failmezger. Paget, Discoverer of Hades. Front Royal [VA]: National Media Services, 2013; A.G. McKay. Cumæ and the Phlegræan Fields. Hamilton [Ont]: Cromlech Press, 1972; Daniel Ogden. Magic, Witchcraft and Ghosts in the Greek and Roman Worlds: A Sourcebook. Oxford: Oxford University Press, 2002; R.F. Paget. “The ‘Great Antrum’ at Baiæ: a Preliminary Report. Papers of the British School at Rome 35 (1967); R.F. Paget. In the Footsteps of Orpheus. London: Robert Hale, 1967; H.W. Parke. Sibyls and Sibylline Prophecy in Classical Antiquity. London: Routledge, 1988; P.B. Wale. “A conversation for ‘The Antrum of Initiation, Baia. Italy’.” BBC h2g2, accessed 12 August 2012; Fikrut Yegul. “The Thermo-Mineral Complex at Baiæ and De Balneis Puteolanis.” The Art Bulletin 78:1, March 1996. Excellent mike thanks for bringing this up. Fascinating. Sounds to me a lot like the Labyrinth of Daedalus, much-copied through the ancient world. Kerenyi notes that the key to successfully navigate the Labyrinth was by making a decisive turn at the center, starting on a course that would spiral back up to the surface. Christian purgatories like the one imagined by Dante or St. Patrick’s Purgatory (a cave on Station Island near Lough Derg in Ireland, closed in 1632), were a similar harrow through the Hell to try the Christian nerve. Really interesting story that is well written too. That is really, really cool. I wish we had more definite information. I prefer to read about solved mysteries. Now I’m just left wondering. Amazing! I love this kind of content. Yet much remains mysterious about the Great Antrum–not least the vexed question of how ancient builders, working with primitive tools at the end of the Bronze Age, could possibly have known of the existence of the “River Styx,” much less excavated a tunnel that so neatly intercepted it. There is no trace of the boiling river at the surface–and it was not until the 1970s, after Paget’s death, that his collaborators finally discovered, by injecting colored dyes into its waters, that it flows into the sea miles away, on the northern side of Cape Miseno. to match the number of those bits of dust. will shrivel to a trifling size. The name (source of the name for Jupiter’s moon perhaps) is also that of the woman (aka Adamanthea) who “who suckled the infant-god [Zeus] in a cave in Cretan Mount Aigaion.” Curiously there’s an ancient woman in Dan Simmons’ SF tale Ilium who first appears living in an ice cave. This is neat! Thanks for the post. Is it not obvious that there must have been a natural cave which was widened as part of the design? I guess that’s too mundane in a world of Ancient Aliens. It is not obvious from the detailed plans worked on by Paget and Jones for four years that there is any natural cave which was widened. The single entrance tunnel is about 18 to 20 inches wide, and runs dead straight for 428 feet to the divide. The walls are smooth, the floor is smooth and the ceiling is arched. It is unlikely there was a fissure this long and straight, ending suddenly, that could be widened and shaped. There is no evidence of any modifications or alterations to this entrance tunnel. It is hand cut into the solid tufa. The water at the River Styx is not sea water, it is fresh, drinkable, water, not even stagnant. Paget and Jones drank some of it. The river is fed by two narrow entrances to the left of it, now submerged. These entrances are too hand cut and a man can just squeeze through. They join up into some kind of chamber behind, but this has only been entered on one occasion and nobody knows what is really going on there. It remains a mystery how they knew to carve their way in at that point to find hot springs behind and it would appear they would instantly perish and drown at the moment the water rushed in. The Styx is now impenetrable, even by frogmen, largely because of the soil and debris Paget and Jones shovelled down into the Styx through a vertical shaft in a tunnel Paget called ‘The Rise’ which sits above the river near its entrance. It was necessary to clear this tunnel to gain access to the sanctuary. There was nowhere else to go until this was done. There is a tunnel leading up to the sanctuary from the back end of the Styx, frogmen found it and it connects up with a tunnel that can be seen leading off the sanctuary. This tunnel remains blocked with soil and has not been cleared by anyone. There is no guide who will take you down any of these tunnels. It is off-limits to anyone, even if permission is requested of the authorities. “Obvious that it was a natural cave that was widened”? 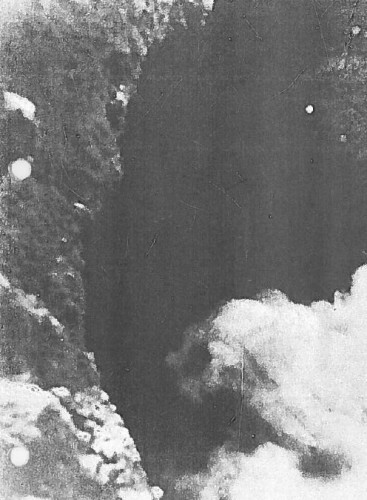 A natural cave that was LESS than 20 inches wide, and traveled on a perfectly straight course for several hundred yards, so they could easily widen it to 20 inches by 8 feet without once having to deviate from their course? I think that what is “obvious” is that that is NOT the case. I think if anything is “obvious” about it, it’s that the tunnel was dug without any idea that this underground river was there, and they adapted their plans to account for it once it had been discovered. I don’t know about obvious, but this could be. 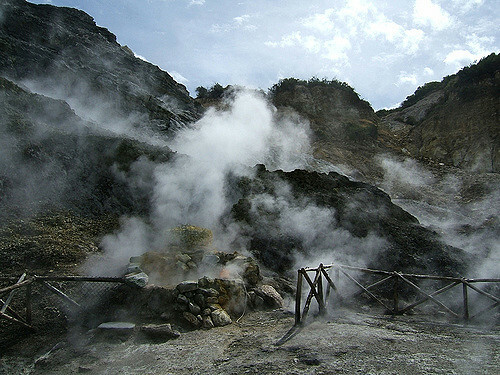 The later Roman resort used geothermal hot springs, so there must have been water emerging from the ground in different places. But if it did make its way to the surface from the “Styx” the pressure must have been relieved somehow, because it wasn’t coming out of the tunnel they dug. In the diagram, you can see that the “Styx” is at sea level, so maybe some ancient engineer figured that a tunnel dug to that depth would hit water. Generally I do not read article on blogs, however I would like to say that this write-up very compelled me to take a look at and do so! Your writing taste has been surprised me. Thanks, quite nice post. yeah the catacombs…they have parties and tunnel culture, in Paris anyways, I have heard…there was a party room with a dj booth here, under one manhole…it is welded shut now, I been told, it’s been maybe seven years since I was down in that one Cool. On Yegül’s upper level drawing we can see that he shows a dotted passage leading to chamber at the top centre right of the plan. This was a tunnel that was the first to be investigated by Paget and Jones in 1962. Like the main complex of tunnels, it had been deliberately blocked and filled with earth in Roman times, before the site was buried in volcanic ash. Paget and Jones made metal scoops for their hands and in their own words burrowed in like rabbits. The tunnel angle shown here is wrong, but the tunnel does lead to a chamber within the hill, with some other extremely narrow tunnels running from it. As Paget and Jones dug this tunnel out, presumably the addition on this later plan is as a result of their work. It would appear that Fikret Yegül was working from Amadeo Maiuri’s drawings, as he has copied Maiuri’s very wrong north sign. 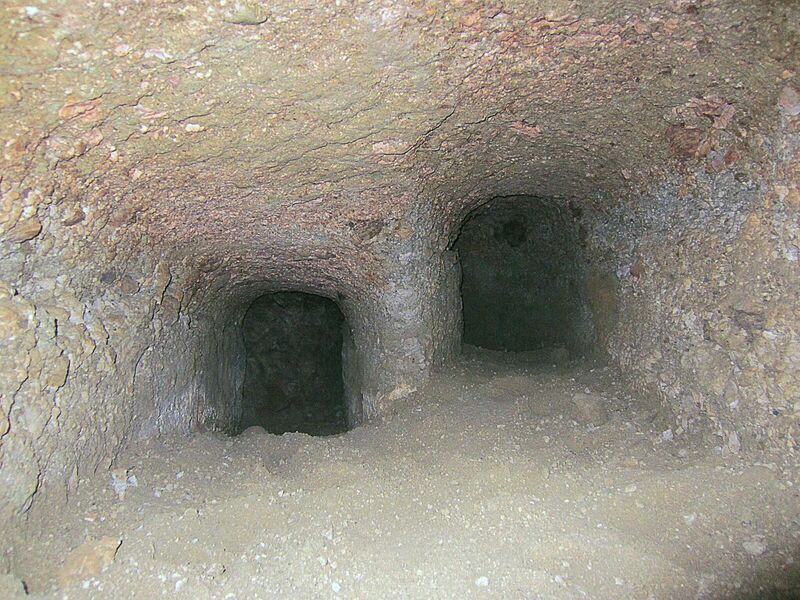 I am recently reliably informed by an eye witness who went inside the oracle tunnels many times, with and without Paget, that Yegül’s plans confuse rather than enlighten. Yegul discounted Paget’s findings in a published document as fanciful. I am hoping to get copies of Maiuri’s detailed excavation drawings in due course, which I will comment upon at www,oracleofthedead.com. The world’s first dark ride. This is amazing and wonderful. I haven’t been so excited while reading something in a long time. It’s awesome when a little piece of history is found and excavated. I can totally see ancient priests drugging initiates and taking them to Hades. I mean, by the description it sounds like some type of attraction, but I don’t know how popular that concept would’ve been back then. Although imagine being one of the first people to go down there during the excavation and then freaking out because it looks like you’ve stumbled upon the real underworld. During the excavation nobody went down there, at least officially they didn’t. Amedeo Maiuri forbade his workmen to enter on the grounds that there might be noxious fumes. A wooden gate was erected across the entrance to the tunnel, now perished. Doc Paget and Keith Jones were the first to enter 6 years or so later. My personal view is that the tunnels are initiatory and to do with the mysteries. A rite of passage involving an ordeal – crossing the Styx – to get to the sanctuary. A symbolic death and rebirth perhaps. Being ‘popular’ may have had nothing to do with it. The legends of there being an oracle of the dead in this region were persistent. BTW, I noticed you replied to someone on another blog entry, and told him that some more research had been done, and a new theory had been developed, only you agreed not to speak about it until it was published. Any word of that coming out? Because I’d love to read any new info about this place. Work is still being done – I gather the Italian archaeological authorities are more amenable to exploration of the tunnel system than they have been, and that some more investigation of its plan and structure has been going on. But no results that I have heard of, as yet, I’m afraid. Hi Mike, it’s time I caught up with you again. There have been a number of developments at Baia over the last few years. Nothing highly significant – the official line is still that these complex tunnels are a simple steam vent supplying steam to some Roman baths. There is much that will now be made public. A lot of tedious politics has prevented this until now. Good to hear from you, John. As you’ll have seen from the comments section, I’m not the only one who’s anxious to know more about what’s been going on at Baia. We’re looking forward to finding out more when you’re ready to tell it. He says this is a quite standard way of portraying Roman dates. So there we have it. The daub is probably a date. Equates to 26th February in our terms. Which year? Not stated.